The license manager communicates with the application using the TCP/IP protocol and TCP communications always specify a ‘port’ which is a number between 1 and 64000 and identifies a kind of communication channel. 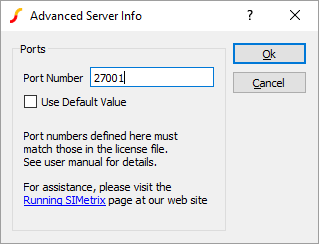 By default, the FLEXnet license manager uses one of the ports in the range 27000 to 27009 and the application will scan through these in sequence. In most situations the server will use port 27000 and, as this is the first port to be scanned by the application, everything will work fine. In some situations, the server might use another port usually because 27000 etc. is already in use. With the default settings, this may cause a start up delay as SIMetrix searches for the correct port. This problem mostly occurs when running under Windows. In this situation, specifying the exact port number at both ends will resolve this problem. See below to find out how to do this. If you are accessing the license manager through a firewall, you will need to open up a suitable TCP port. In this situation, it is best to specify the exact port number so that only one port needs to be opened. enter the port number as required. 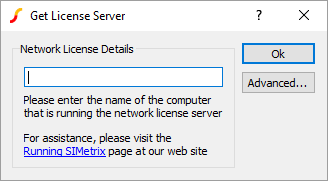 If you have already entered license information and wish to change it, select the menu Help|Reinstall License... then restart SIMetrix. This will force the re-entry of license information.